I look forward to Shark Week on the Discovery channel for 50 weeks out of the year. It would be 52 but one is set aside for actually watching Shark Week and the other is the week I’m on vacation at the beach and I hate myself for just watching it. 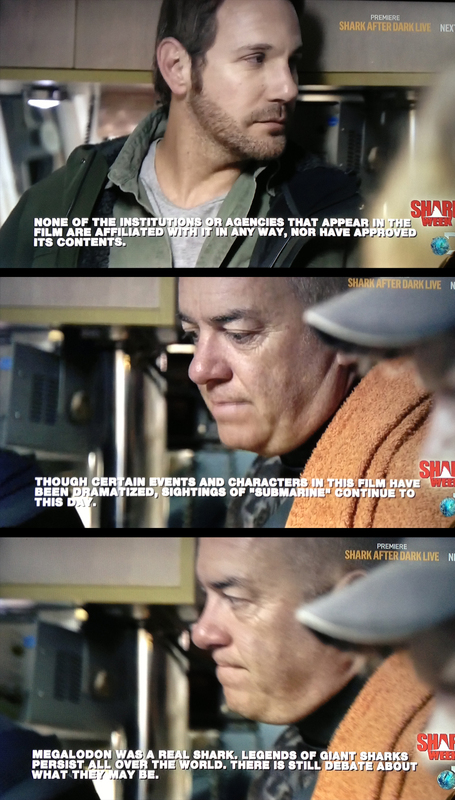 Anyway, did anyone else catch that disclaimer at the end of Megalodon? Probably not because it went by so fast and if you had a DVR, it was conveniently placed under where the controls pop up. It just so happens that I spent 5 minutes trying to catch it to share with you. Below is the text from the disclaimer. None of the institutions or agencies that appear in the film are affiliated with it in any way, nor have approved its contents. Though certain events and characters in the film have been dramatized, sightings of “submarine” continue to this day. Megalodon was a real shark. Legends of giant sharks persist all of the world. There is still debate about what they may be. Way to go Discovery Channel. You’re supposed to be educational and now I don’t know what to believe. I guess that makes a little more sense why so many of the images looked like CGI. I really hope you don’t ruin the rest of Shark Week. However, I guess I can say I was entertained by the mockumentery. Now bring on the real shark stuff.